The researchers created a 2-D liquid consisting of nanoparticles at the interface between a drop of oil and surrounding water. A University of Pennsylvania team has now shown how to make nanoparticles that are attracted to this interface but not to each other, creating a system that acts as a two-dimensional liquid. By measuring this liquid's pressure and density, they have shown a way forward in using it for a variety of applications, such as in nanomanufacturing, catalysis and photonic devices. The work was conducted by postdoctoral researcher Valeria Garbin, graduate student Ian Jenkins and professors Talid Sinno, John Crocker and Kathleen Stebe, all of the Department of Chemical and Biomolecular Engineering in Penn's School of Engineering and Applied Science. "Things get stuck at the interface between oil and water," Stebe said. "That's of tremendous fundamental and technological interest, because we can think of that interface as a two-dimensional world. If we can start to understand the interactions of the things that accumulate there and learn how they are arranged, we can exploit them in a number of different applications." "We understand how particles work in 3-D," Crocker said. "If you put polymer chains on the surface that are attracted to the solvent, the particles will bounce off each other and make a nice suspension, meaning you can do work with them. However, people haven't really done that in 2-D before." The nanoparticles' ligands bumpers keep them from sticking together while remaining at the oil-water interface. Even when particles are able to stay at the interface, they tend to clump together and form a skin that can't be pulled apart into its constituent particles. "All particles love themselves," Stebe said. "Just due to Van der Waals interactions, if they can get close enough, they aggregate. But because our nanoparticles have protective ligand arms, they don't clump together and form a liquid state. They're in two-dimensional equilibrium." The team's technique for surmounting this problem hinged on decorating their gold nanoparticles with surfactant, or soap-like, ligands. These ligands have a water-loving head and an oil-loving tail, and the way they are attached to the central particle allows them to contort themselves so both sides are happy when the particle is at an interface. This arrangement produces a "flying saucer" shape, with the ligands stretching out more at the interface than above or below. These ligand bumpers keeps the particles from clumping together. "This is a very beautiful system," Stebe said. "The ability to tune their packing means that we can now take everything we know about the equilibrium thermodynamics in two dimensions and start to pose questions about particle layers. Do these particles behave like we think they should? How can we manipulate them in the future?" 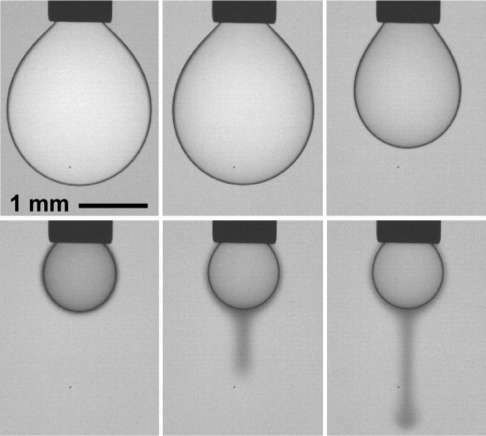 "We can infer the pressure of this 2-D fluid by the shape of the drop," Stebe said. "Once we compress the drop by pulling some of the oil back into the syringe, we can determine how the shape changes and relate it to the pressure in the layer." "Fortunately, we discovered another interesting feature of this nanoparticle system," Garbin said. "If the drop was compressed too much, some particles would fall out of the interface because they didn't fit anymore. This enabled us to measure the amount of particles that were in that falling plume, since the particles are farther apart from each other there. From that measurement, we could work backwards to the number of particles on the interface"
The smooth relationship between the particles' packing and the pressure of the 2-D liquid they form provides the basis of universal rules that govern the physics of such systems. "From this data," Crocker said, "we can figure out the force versus distance of two nanoparticles. That means we can now make a model of how these particles behave in the 2-D liquid." "One application is interface catalysis," Stebe said. "For example, if you have a reagent that's in the oil phase, but its product is in the water phase, having a particle on the interface that can help move it from one to the other would be perfect."